Edinburgh is packed with history, culture, architecture and overall good times. But how much do you really know? Whether you’re a local or a traveller, it’s time to brush up on your knowledge of this great city. Hey, it might be a good icebreaker – play the Alphabet Game of Edinburgh. One of Edinburgh’s many nicknames is Auld Reekie. Don’t worry, it’s not because the city itself smells bad – Auld Reekie actually translates to old smoky. The name originates from back in the day when Edinburgh was black with smoke from coal and wood fires. Nowadays, it’s more of a term of endearment. Locals might recognise the name being used for Auld Reekie Tiki Bar and Auld Reekie Ghost Tours. No, we don’t mean the strip bar. In 1823, the Judgement of Death Act caused a significant drop in the number of crimes punishable by death. Unfortunately, this also caused a massive shortage in dead bodies for medical students to dissect for research. 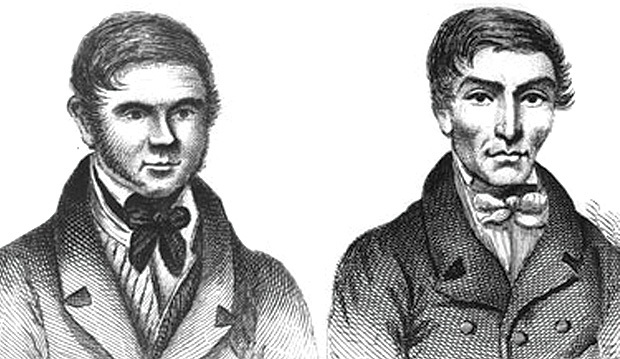 Enter Burke and Hare, the most notorious Anatomical Murderers of the 19th century. They killed at least 16 people between 1827 and 1828, and made big bucks selling the bodies to Dr Robert Knox’s anatomy school. They designed the murders to leave no ‘signs of murder’, but the body of a woman was found in Burke’s bedstraw after a Halloween party in 1828. Burke was hung in 1829 and, appropriately, dissected for medical research. The skeleton of Burke hangs in the Anatomical Museum of the University of Edinburgh medical school. Yay, science? The Scottish Parliament located in Canongate, Edinburgh was given the nickname the creeping parliament in the 16th century. This was because people had to crawl on their hands and knees to get to Parliament to avoid gunfire from Castle Rock just above. Nowadays, Castle Rock is just a fun hostel. The Stone of Destiny is the sacred coronation stone of British royalty, which was removed from Edinburgh Castle by King Edward I. 700 years later, on St Andrews Day in 1996, the stone was transported 400 miles from Westminster Abbey to Edinburgh Castle. The Elephant House Café is known as one of Edinburgh’s “Harry Potter Cafés”, one of the places where JK Rowling wrote many of her early novels. The bathrooms alone are worth the visit – the walls are now filled with fan art and quotes from visitors. 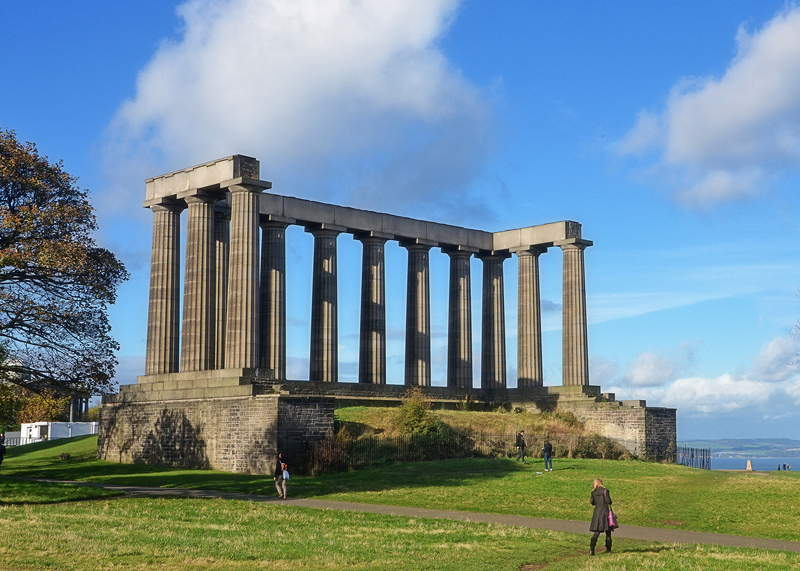 On top of the famous Calton Hill lies the National Monument. Unfortunately, this is also known as Edinburgh’s Folly (aka Shame). Celebrated architect William Playfair had grand plans to model the building after the Parthenon on the Athenian Acropolis, and collected £42,000 to complete his masterpiece. Somehow, Playfair chewed up the fund far too quickly. As a result, the project was abandoned after only completing the base and twelve columns. Tourists still seem to enjoy visiting it though. Edinburgh has made an appearance in Grand Theft Auto: San Andreas! The Kincaid Bridge spanning Easter Bay in San Andreas is based on the Forth Bridge just outside Edinburgh. The name Kincaid is also believed to be based on the medieval Scottish clan Kincaid. Margaret Dickson was hanged in the Grassmarket in Edinburgh in 1724, for murdering her newborn baby whom she claimed was stillborn. She was placed in a cheap wooden coffin, which she was to be transported in to her place of burial in Musselburgh. However, the coffin let air in to her body and somehow, combined with the jostling, she awoke. Under Scots Law, if an individual survived an execution they were regarded dead in law and could not be rehanged. So, in what some regarded as an Act of God, Maggie went on to live another 40 years. The Edinburgh Fringe Festival had over 53,000 performances of 3,398 shows at 300 venues in August 2017, making it the world’s largest arts festival. However, when the festival was founded in 1947, it was simply known as the Edinburgh International Festival. Performers started creating unofficial shows ‘on the fringe’, and formed the Festival Fringe Society in 1958. And thus: the Fringe Festival was born. As we mentioned before, JK Rowling wrote many of the Harry Potter novels in Edinburgh. For a complete list of Harry Potter sightseeing spots in Edinburgh, check out our Potterhead checklist here. The Edinburgh Zoo is the only zoo in the UK that has koalas. The Koala Territory has three koalas: Alinga, Goonaro and their baby, Yooranah. Edinburgh was the first of 28 cities to be named a UNESCO City of Literature. The city is home to many critically acclaimed writers including Sir Arthur Conan Doyle, Sir Walter Scott, JK Rowling, and more. Every year, Edinburgh also hosts the biggest literary festival in the world – the Edinburgh International Book Festival takes place August 11-27th in 2018. Between 5-10pm on January 1st to 25th in 2018, Edinburgh will be turned into the pages of a new short story by Val McDermid. Message from the Skies will form a route which projects the stories onto the landmarks and buildings of Edinburgh. The Royal Mile is the pinnacle of Edinburgh’s tourism. The name is slightly deceiving though, as the Royal Mile is in fact 1 mile and 107 yards in length. But let’s not get too pedantic here. The Princes Street Gardens are now a popular place to relax in the (occasional) sun. But before it became the Princes Street Gardens, it was the sinister lake known as Nor Loch. 300 accused witches were thrown into Nor Loch – if they floated, they were deemed guilty and burned at the stake nearby (which is now a fountain). If they drowned, well… You know where this goes. Old Town, formerly known as Auld Toun, is the oldest part of our capital. As a protected UNESCO World Heritage Site, it has preserved its medieval street plan and several buildings from the Reformation era. Edinburgh is home to the Guinness World Records holder for most pierced woman on earth. Elaine Davidson, who frequently strolls along Nicholson Street and the Royal Mile, has 10,503 piercings. She has over 500 on her genitalia alone. The Queen Victoria Statue is one of the two female statues in all of Edinburgh. This means there are more statues of animals – one of which is a beer-drinking Polish bear named Wojtek – than women. Nowadays, you might stroll down Rose Street for a trip to M&S or a nice meal at an upscale pub. But back in the day, Rose Street was Edinburgh’s official Red Lights District. Some claim that the name Rose Street derives from the old expression for soliciting a prostitute, ‘picking a rose’. It has since been unofficially moved to the charmingly named Pubic Triangle between Grassmarket and Lothian Road. Ah, it is Christmas after all! Turns out, the character of Ebenezer Scrooge was based on a real guy. Back in 1841, Dickens decided to stroll through the Canongate Kirk graveyard (as one does before a lecture). He came across a headstone which read “Ebenezer Lennox Scroggie – a meal man”, which Dickens misread as “a mean man”. Dickens was left wondering why Ebenezer was doomed to such misery post-mortem. And then he decided to write a Christmas story about it. Edinburgh has 112 parks, and more trees per head of population than any other city. 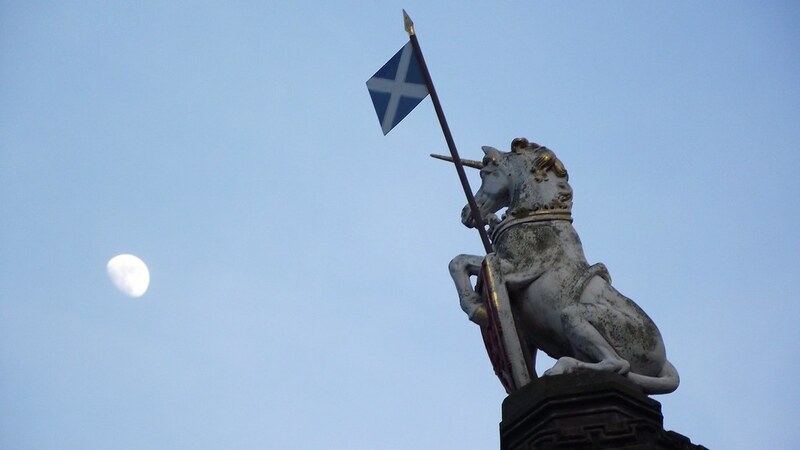 The unicorn is Scotland’s national animal. No, seriously. There are at least 6 unicorn statues in Edinburgh, including one made of ice. Maybe they’re female unicorns though? Arthur’s Seat isn’t the only volcano in Edinburgh. The Edinburgh Castle sits on a rock which acts as a plug for an extinct volcano which formed around 350 million years ago. Get it? Castle Rock? Edinburgh’s principal train station was named after Sir Walter Scott’s famous novel, Waverley. We’ve got nothing for X. If you find something, let us know. If the koalas weren’t enough, the Edinburgh Zoo went ahead and knighted a penguin in 2008. But not just any penguin – a Norwegian penguin named Nils Olav. In 2016, 50 Norwegian soldiers joined him at the zoo for his promotion to brigadier. That’s Brigadier Sir Nils Olav, to you.